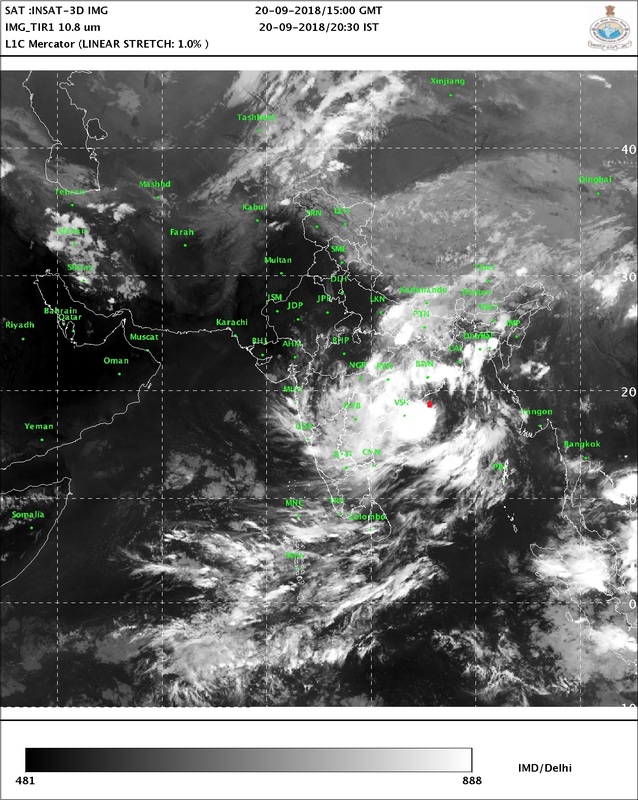 BB-11 , Estimated at 996 mb, now a deep depression,almost a cyclone (As per IMD norms, cyclone is classified with a core wind speed of 34-47 knots, corresponding to 62-88 kmph,as estimated wind speed now average around 30-33 knts as per various agencies. DVORAK estimates winds at 30 knts. The Southern segment shows very deep convective clouds. North is milder convection. Location 18.2N and 86.3E...tracking Westwards now and expected to cross the A.P. /Odisha coast tonite. Tracking W/NW,very heavy rainfall expected in Telengana on Friday and Marathwada on Saturday.Heavy showers on Friday in Hyderabad. Interior Maharashtra Madhya Maharashtra will get thundershowers, including Konkan. Mumbai will see increased thunder showers on Saturday and Sunday. Cloudy, Thunder showers and occasional showers in Pune till Monday.Cool day with 24c max on Saturday. Thunder Showers also likely in Outer Townships of Mumbai. Fizzling out to UAC on centre reaching M.P. Every year withdrawl of SWM is getting delayed only central India (Orissa, MAHA, MP,GUJ, RAJ) have maximum benefit. If NEM fails SE India will become desert (already Rayalseema is in desertification process). Very glad to see that SWM is coming back in a good way after a long period of silence. Hopefully it will help all the farmers in central India who are facing a deficit otherwise. Gujarat has so far not received any rains this year. Hope some SWM rain reaches there somehow. May the SWM last until mid October and bring more bountiful rains. What are your thoughts on the way monsoon has behaved this year. How do you see remaining days of monsoon for Mumbai.It is disappointing till date. Why this monsoon is weak?any special reasons for that? Hi Rajeshbhai, with the passage of this Weather system (Cyclone Daye), what is the status of Monsoon withdrawal from India? Also, how do the last few days of SWM for Mumbai look? The weather has definitely turned warm and muggy in Mumbai since the last couple of days, typical of end September / October. Seems vagaries has underestimated BB-11.... First it has stalled withdrawl of SWM impacting NEM.. Another typhoon may spoil withdrawl? Punjab, Himachal Pradesh, Chandigarh flooded...army on red-alert. Vigorous torrential 3 digit widespread rains (300-200mm) of rain. Schools closed. Typhoon Trami churning fast. Will this again stall SWM withdrawl ? Haryana and Rajasthan are arid places. Even after this depression which is an unexpected parting gift from this monsoon, both these places have received less than normal rainfall this year. Haryana is 11% below normal. Rajasthan is 5% below normal.